Volvo has partnered with Hirschmann MCS to install the cSCALE rated capacity indicator on their PL4809E and PL3005E pipelayers. Hirschmann's cSCALE solution provides a 7" color graphic display of the pipelayer and monitors the maximum load and inclination. Sensors include angle, tilt, load pin, and anti-two block switch. An integrated datalogger / event recorder was also a requirement for the system. "The Volvo load management system is the only one of its kind," said Tony den Hoed, Lead Engineer of Volvo's Pipelayer Product Platform. 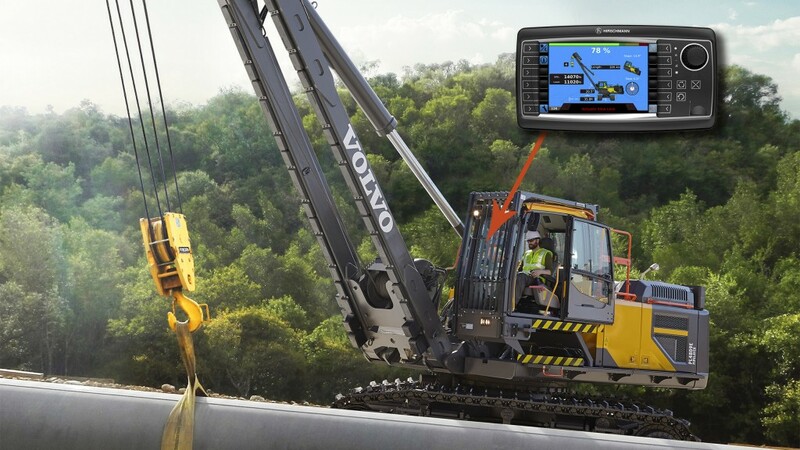 "The combination of logic developed by Volvo with hardware and software supplied by Hirschmann has set the bar for safety in the industry."